At the opening of the Synod of Bishops, in Rome, the Pope Benedict XVI Said that the men of nowadays want to live without God, which makes the society more confused and unhappy. The Pope looked scared with the diminished influence of the Catholic Church in our world. In an article published in Jornal do Brasil, Mauro Santayana wrote: “The 20th century was the hardest of History, because the hierarchy didn’t know how to listen to the apostle who Christ sent to Vatican, in the admirable figure of Angelo Roncalli. The Council, gathered in 1962 by the peasant of Bergamo, was the greatest opportunity for the Church to come back to the footsteps left by Christ on the paths of Palestine, but his successors lost them. Though the memorable encyclicals (mainly the Pacem in Terris), which returned to the preoccupations of the Gospel, and brought the Good News to the world, the Vatican was abandoned, little by little the doctrine of John XXIII, and combating, with no complacence, in the body of the Church. The aggiornamento he intended took another way. Roncalli, who talked to the both sides of the world – Kennedy and Khrushchev –, had his eyes on the poor. As the successor of the fisherman Peter, the mission he was assigned to was, little by little, to remind the Catholics that Christianity was not only the Lord’s Prayer, but required to come to Christ who multiplied bread and fish and forgave the adulterer”. The article goes on: “One of the greatest secrets of the extraordinary conductor of Church was his real affect towards others. For days, the great public Brazilian man Waldir Pires has been telling this columnist the visit he had done, as a congressman, to the Vatican, accompanied by his wife, Yolanda, pregnant back then. The protocol determined that the women kneeled down before the Pope, and when he was approaching the group, Yolanda started bending down to perform the rite. John XXIII ran up to her and, grabbing her arms, stopped the gesture. After some caring sentences, he blessed her. Christ would have done it, we can imagine”. Finishing up the articles, Santayana observed: “The Church is claiming a new and great Pope, who can save it and, as he saves it, helps the Western man reestablish his covenant to Creation. 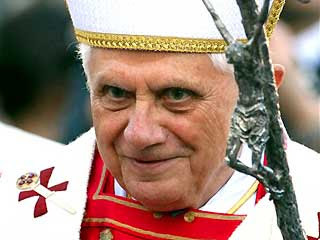 Up to now, it won’t be Pope Ratzinger the predestinate to promote this necessary revolution”. The analysis contained in this article explains, at least partially, what was said here last week. There are many reasons for the reduction of vocations and empty Catholic temples. It is needed, thus, a great effort to strengthen the faith in our Father, a vital necessity for the world to be transformed and we can keep the covenants He expects us to keep. After all, we are not here on vacation and we have two clear goals to achieve. One is about our personal development; the other is about the general progress and our bit in the work of Creation.